← Human population overshoot–what went wrong? In my view, the biggest contributor to high oil prices is the first one–stalled out oil supply. At this point, the interaction between oil demand and oil supply does not work in the way most people expect it would. 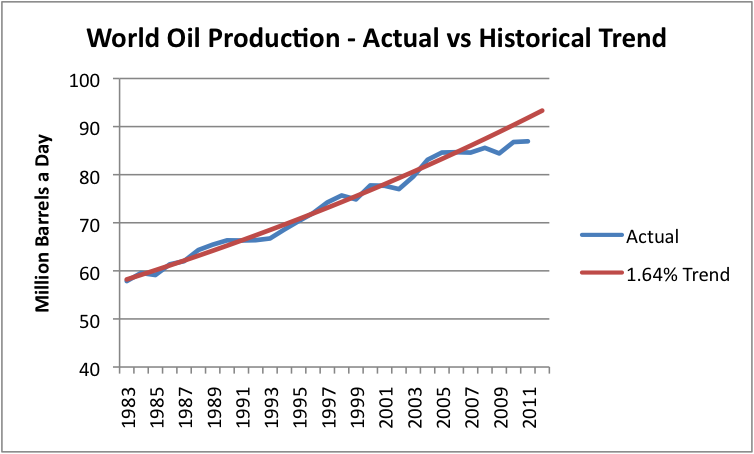 Even if the price of oil rises, world oil production doesn’t increase by very much (Figure 1), if at all. Figure 1. 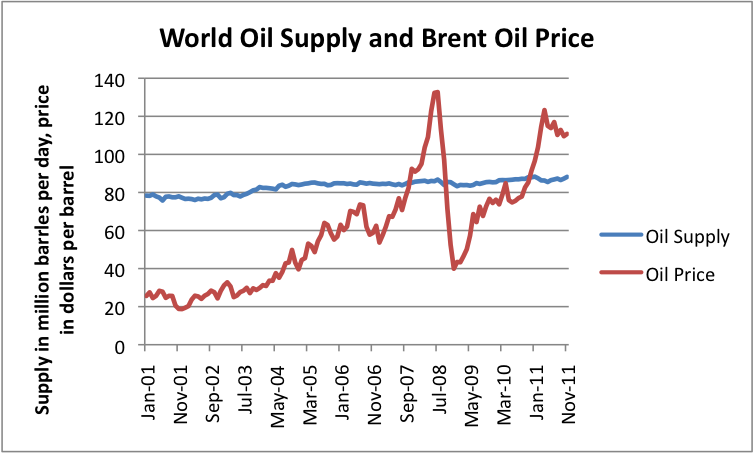 Brent oil spot price and world oil supply (broadly defined), based on EIA data. In the words of economists, world oil supply is relatively inelastic. This is true, even though the oil supply shown in Figure 1 is what is sometimes called “All Liquids,” so includes substitutes for crude oil, such as biofuels, natural gas liquids, “refinery gain,” and any fuels from coal-to-liquid and gas-to-liquid processes. These substitutes are not growing by enough to make up for the shortfall in crude oil growth. If we compare recent oil production with that in the 1980s and 1990s, we see that about 2005, growth in world oil supply suddenly slowed down (Figure 2). Figure 2. World oil production (broadly defined) based on EIA data, with exponential trend line fitted by author to 1983 to 2005 values. The amount of the oil shortfall is huge. It is far more than the amount of oil taken off-line by Libya, and more than Saudi Arabia’s supposed spare production capacity. Given the high price of oil, most of the missing oil seems to be oil that we do not have production capacity for. In recent years, emerging markets such as China and India have been increasing their demand for oil. If anything, it seems as if their huge additional demand would ramp up required oil supply even more quickly than predicted by a trend line from the 1983-2005 period. Instead actual production (and consumption) is lower since 2005. Iran. Clearly concern about the Iran situation is having an impact on oil prices. As long as there is worry about instability in the Middle East, there is likely to be pressure on oil prices. Iran produces about 4.2 million barrels a day, and consumes about 1.8 million barrels a day, leaving about 2.4 million barrels a day for exports. Of this, 2,156,000 is reported by the EIA to be exports of crude oil; the remainder is exported as refined products. Figure 3. Iranian oil production and consumption. Figure by EIA. According to the EIA, Iran’s top export destinations are China, Japan, and India. The EU and Turkey are said to import 650,000 barrels of oil a day, with one source in Turkey accounting for 200,000 barrels of the total. France and Britain are reported to account for very little of Iran’s oil exports. Besides concern about exports, there is also concern that oil that might be delayed passing through the Straight of Hormuz. Currently 17 million barrels a day of oil passes through the Straight of Hormuz, with 85% of these exports headed for Asian destinations. While other routes are available, there would be delays and higher costs involved. Even if the delays do not directly affect the US and the EU, there would likely be indirect impacts on world markets. The world clearly cannot get along without 2.4 million barrels a day of exports from Iran, although perhaps losing only the EU portion of those exports (about 500,000 barrels a day) might be tolerable for a time. While some oil from Libya is coming back on line, oil prices are still very high. In a world where oil production is not rising by much, any loss of production is a problem because of the adverse impact high oil prices have on economies of oil importing countries, including those of the EU, Japan, and the United States. Any loss of production also leaves us more vulnerable to disruptions if another oil exporter suddenly has difficulties. Low interest rates. Low interest rates should theoretically not directly affect oil prices, but if alternative forms of investment do not provide a reasonable yield, this fact may affect oil decisions as well. For example, if prices are trending upward, there may seem to be a premium for holding oil off the market. If interest rates are very low, this will make the comparison seem even better. Thus artificially low interest rates would seem to reinforce an upward oil price trend. Furthermore, if artificially low interest rates actually induce businesses and individuals to invest in durable goods, production of these goods will require more oil, as well as other types of commodities. But we have already seen that oil supply does not really increase by much, even with large price increases. Thus, because of this effect, low interest rates will also act to increase oil prices, at least until recession (because of high oil prices) hits again. This entry was posted in News Related Post and tagged gasoline price, high oil price, Iran, low interest rates, oil price, oil production, oil supply, recession, world oil production, world oil supply. Bookmark the permalink. Other reason is that in EU the gas price is about double than the US price – so more and more people think car drive is no “affordable” – if it is possible than change. In Budapest we see much less traffic jams this year then the last – however car drive is still slow in the city. So the process of change is ongoing in the present and not something that will happen sometime. Thanks for your perspective. I don’t think we are as far along here. However I would not be sure about the European city structure is better then in the US – in transition point of view. The Eu city’s “density” is higher than US cityes – this is in one side better taking the commuting into account.However a city consumes a lot energy for other purposes, like food transport to the city. European cities have grown to be huge – in number of citizens and area. The US city structure may be better for a transition time interval -even if in one point the commuting they seem to have more problems. Cities are complex systems so very hard to predict how they will behave in other circumstances. Without enough energy, it is hard to see that cities will do as well as today. They depend on agricultural surpluses and large numbers of jobs outside of the agricultural sector. It is not clear that these will always be around. I am always amused when people complain about $4 a gallon gasoline. If you consider the amount of work that an internal combustion engine can do using a gallon of gas, to how many hours of human labor it would take to do an equal amount of work, a gallon of gas should cost a LOT more. Like 10X more. Try cutting your suburban lawn with a reel push mower, or cutting up a tree with a hand saw, and you will discover the true value of petroleum. When it is gone, we will be in serious trouble. A hundred years from now, I suspect there will be a lot fewer people on this planet, unless some new nuclear energy source like fusion can be perfected. With enough cheap electricity, we could make fuel from seawater. There is no hydrogen shortage in the oceans.